It’s impossible to overestimate the influence that Thomas Edison’s accomplishments have had on modern life. Although Edison (1847–1931) is best known as the inventor of the incandescent light bulb, the phonograph, and the motion picture, these innovations are a fraction of Edison’s legacy. More than 85 years after his death, his accomplishments in the field of industrial research and development still resonate with scientists and engineers. 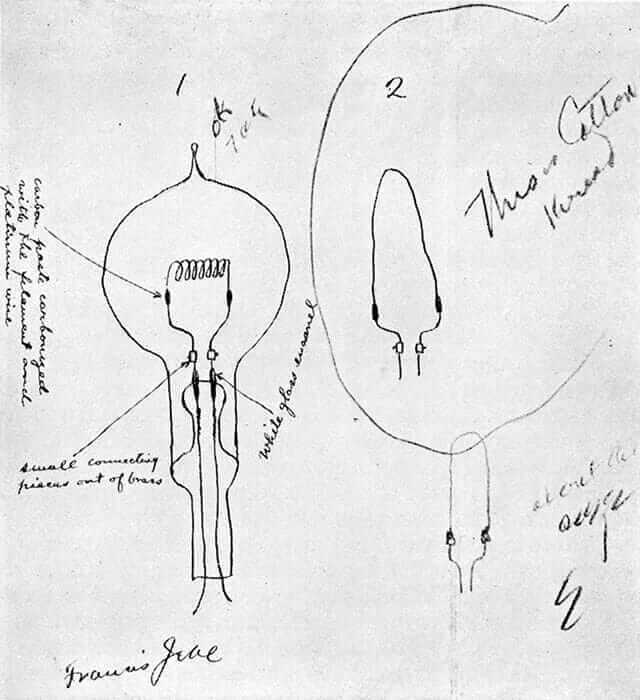 Sketches of early filaments, with comments from Thomas Edison at the top and down the right side. Courtesy miSci, Museum of Innovation & Science. Edison started his career at age 15 as a telegraph operator and developed his first invention, a telegraph repeater, at 16. After years as an itinerant telegraph operator and sometime inventor, at 21, he came to New York City, where he found work as a repair superintendent at the Gold and Stock Telegraph Company. During this period, he developed numerous inventions, including the quadraplex telegraph transmitter, which could send two messages in each direction on a single wire. Selling the rights to this device for $30,000 was Edison’s first real breakthrough as an inventor. With the income from the quadraplex-transmitter sale, Edison opened a workshop where he could develop inventions full time. When Edison was 29, the sale of an electrical-engineering firm holding several of his patents provided the funding to open his first development laboratory, in Newark, New Jersey. A few years later, he moved to another location in New Jersey, what would become the famous Menlo Park facility, and later to a larger site in West Orange. 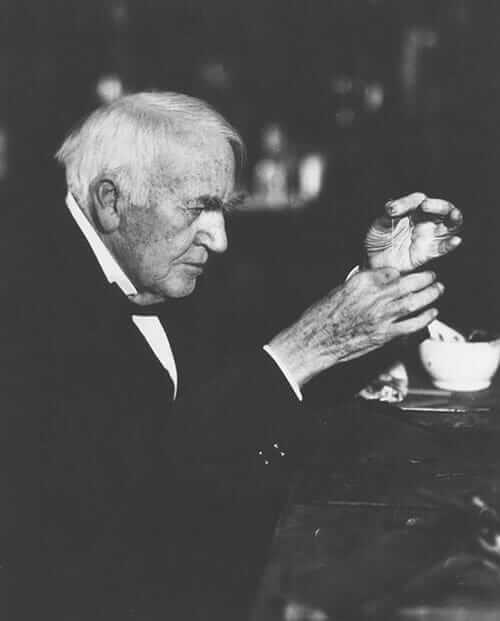 Edison did some of his most significant work in those labs, developing the incandescent light bulb and the phonograph—his favorite invention. 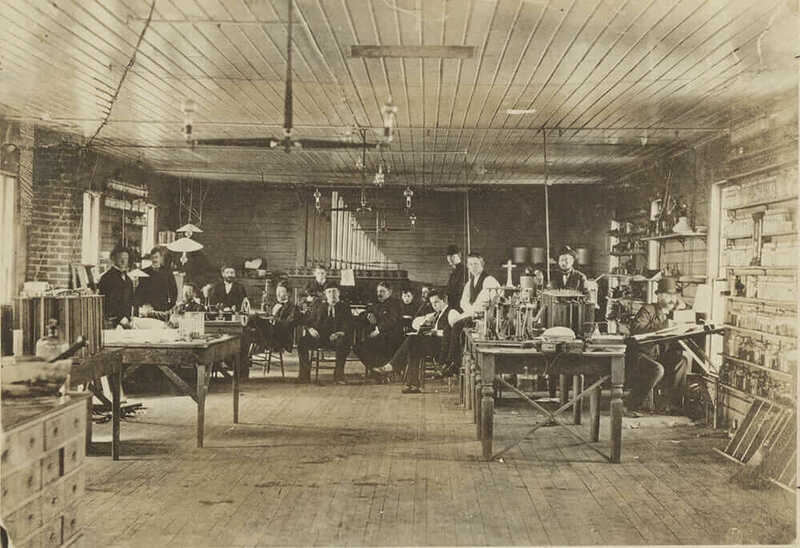 Thomas Edison and his staff inside the Menlo Park laboratory. Courtesy miSci, Museum of Innovation & Science. 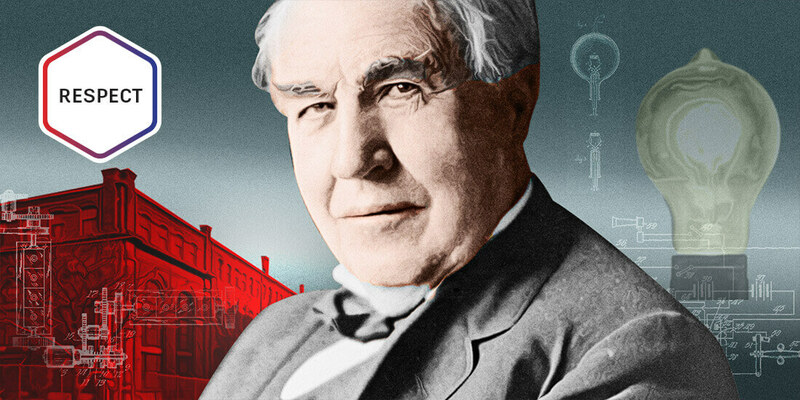 In his lifetime, Edison received 1,093 patents—more than any other person in history. Although Edison is the recognized inventor of some of the most significant technologies of his day, the team working under Edison’s direction was vital in bringing his ideas to fruition. Take, for example, the development of the light bulb. Through the spring and summer of 1879, and well into the fall, Edison and assistant Charles Batchelor tested countless materials in search of the ideal filament. In late October 1879, they succeeded with a carbonized cotton filament, producing a light bulb that burned for 14.5 hours. On November 4, 1879, Edison applied for the patent on the incandescent light bulb, the invention that would bring him the most fame. This new approach to technical research and development signaled a switch from the “lone inventor” trope to the collaborative, cooperative model of the Menlo Park laboratory. This is model is still followed by General Electric (GE), which emerged from the original Edison General Electric Company. Thomas Edison re-creates the carbon filament for his first incandescent lamp at the Light’s Golden Jubilee ceremony in Dearborn, Michigan, 1929. Courtesy miSci, Museum of Innovation & Science. “By the 1960s, a much larger, decentralized, and product-diversified GE led to the desire for research more closely aligned with product development,” says Chris Hunter, the archivist who manages GE’s historical records at the Museum of Innovation and Science in Schenectady, New York. Long after Edison was gone, GE labs continued to evolve with this collaborative approach. “GE Global Research, while focusing on product development, still researches the products you might see 10 to 20 years from now in lighting, jet engines, power generation, and other core GE businesses,” Hunter says. Edison’s advancements in R&D labs and electrical power can arguably be tied to his visit to the 1876 Centennial Exhibition. There, Edison saw the Wallace-Farmer dynamo, an early direct current (DC) generator, which inspired his investigation into this emerging technology. Many competitors were working to advance electrical power and exploit its business opportunities. Distributed electricity held benefits for both the industry and the public: Electric motors could replace the animals and noisy, fuel-hungry steam engines currently supplying power, and electric lighting could eliminate sooty candles, kerosene lanterns, and explosion-prone gas. Edison was a proponent of DC power, which put him in conflict with the advocates of alternating current (AC) power—chief among them Nikola Tesla and George Westinghouse. Edison had pioneered electrical-power production and distribution systems before a viable AC model was available, and he was at the forefront of public discourse on the subject. But AC power eventually won out because it could be easily transmitted over long distances and was better suited for powering electric motors. Prefer to watch instead of read? Check this out! However, many Americans’ first exposure to electric lighting was with Edison DC systems (powering his patented light bulbs). His involvement was instrumental in the public’s acceptance of the new technology. 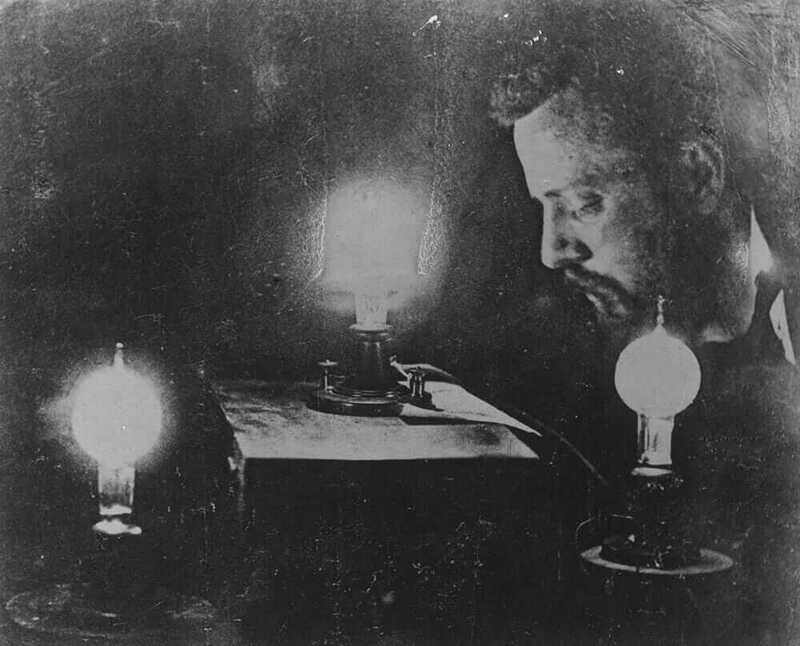 Charles Batchelor pictured in the first photograph taken using artificial light, 1880. Courtesy miSci, Museum of Innovation & Science. Until his death in 1931, Edison accomplished significant work in other fields. During World War I, his defense-related developments included sound-based aircraft-detection systems, improved torpedoes, submarine designs, and naval mines. His most enduring legacy remains those first steps into the world of electrical light, ending centuries of dependence on open flames for illumination. But equally lasting is his contribution to modern engineering: the dedicated industrial research lab. Redshift’s “Respect” series celebrates engineers, architects, designers, and others who have made an enduring impact on their industries.